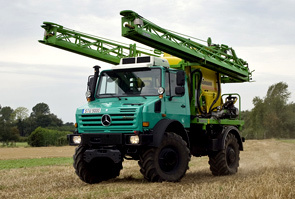 The Mercedes-Benz Unimog is a vehicle in a league of its own: A work and tractor vehicle in one. 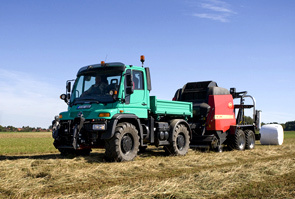 It combines great versatility on the job with fast speeds on roads and outstanding off-road capabilities. With its versatile attachment and mounting areas at front and rear, it can be used all year round. 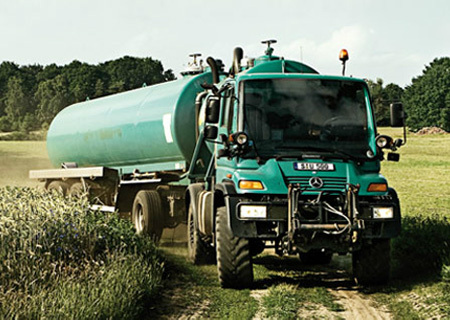 Whether on fields or roads: the Unimog is the universal transport solution. 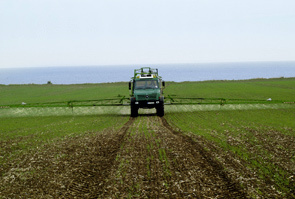 It is much more cost-effective and faster than comparable systems – in particular when it is necessary to get a job done both as soon as possible and efficiently as during harvesting, fertilizing, or maintenance operations. Bigger payloads for less fuel. 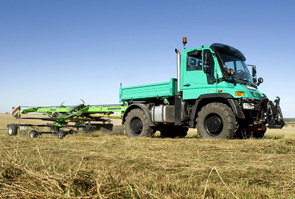 Cost-effectiveness is the key word when the Unimog is used for agricultural operations – whether for running equipment or transporting loads. 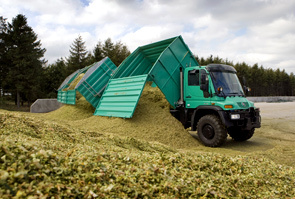 With its up to 40 t overall haulage weight and thanks to its high payload and handling qualities, the Unimog is able to deal with large capacity and heavy loads both fast and effectively. 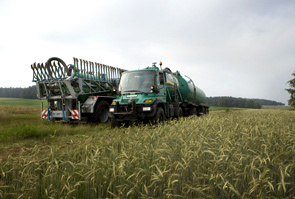 Due to its short chassis, it is able to make the optimal use of the maximum transport length of 18,75 m (61.5 ft.) allowed in the EU – either with several axles or even with two trailers. 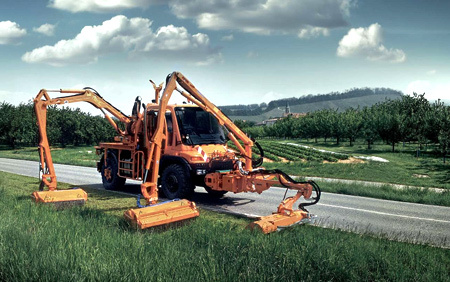 Front and rear-mounted implements can also be attached and removed very quickly so that the Unimog is always ready and waiting for a whole range of jobs that may need doing. 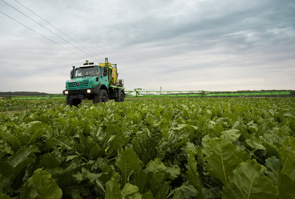 The Unimog not only cuts a good figure during agricultural operations over fields and roads, but also in direct comparison with other vehicles: The advantages of its system make it more versatile, cost-effective and efficient than other systems and with its Euro 5-compatible engines it already complies with the high emission standards for commercial vehicles. 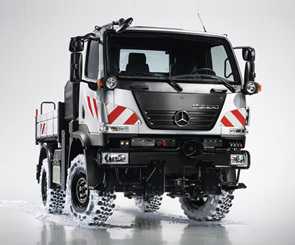 Combined with the reliability and durability of a Mercedes-Benz, the Unimog is a safe investment for the future of your fleet of vehicles. Lower fuel consumption: under 19 l/h average consumption for transport operations with up to 21 t trailer load (DLG Focus Test 07/08). 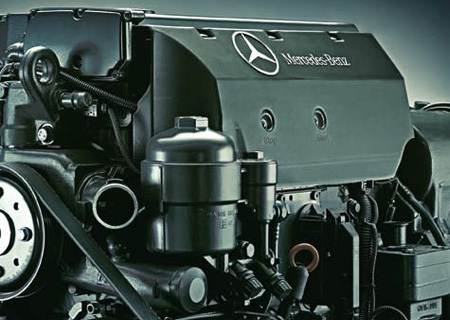 Eco-friendly and fit for the future with engines complying with Euro 5 due to BlueTec® technology. Efficient with its high payload and great load capacity. 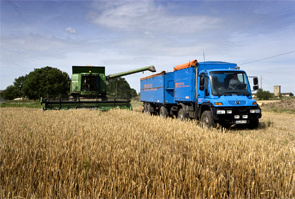 Time-saving with transport speeds of up to 90 km/h (56.5 mph), also on motorways. Great off-road performance which also goes easy on the soil due to unique chassis concept with 4-wheel-drive, single tires and central tire inflation system. 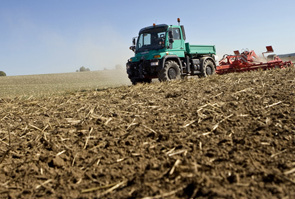 Versatile, thanks to quick-change attachment and removal of implements. Low life-cycle costs (long maintenance intervals, lower tire costs). Very cost-effective due to all-year-round operation. 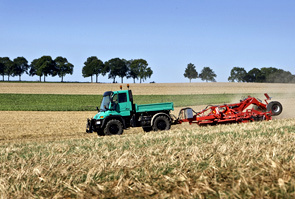 Professional implement-carrier, truck and field tractor in one. Unusually high ground clearance, very good angles of approach and departure, great stability when not moving as well as excellent traction and speeds of up to 90 km/h (56.5 mph) on sealed roads. Keep working, when others have to wait. Work efficiently and comfortably all year round. 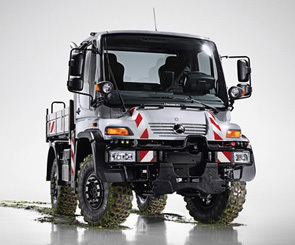 Unimog makes it possible. 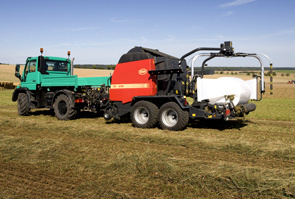 Its implement-carrying concept was developed so that you are able to complete your operations economically, powerfully and efficiently: whether you require express transport and handling or especially cost-effective all-year operation for mowing, clearing snow or cleaning. The operator in the spotlight. 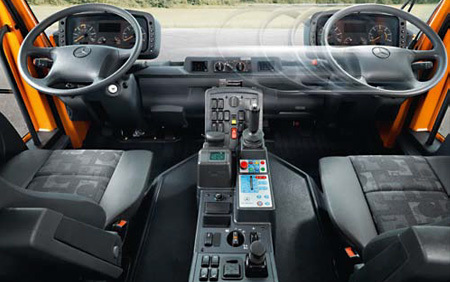 Outstanding visibility of surroundings and mounting points, high safety standards and clearly arranged control elements: The Unimog’s panoramic cab has everything the driver needs to make his working day ergonomic, comfortable and safe. Generous headroom and space to move, high standards of sound proofing and insulation, standard air-conditioning, an integrated parking heater as well as easy-to-operate controls. All of these features help to combat driver fatigue. 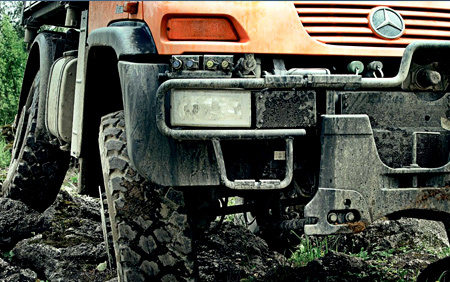 You can go anywhere with a Unimog – so that means we are also to be found everywhere you go. 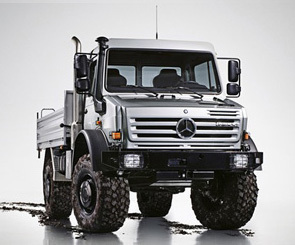 We can attend to your Unimog if needed at over 600 Mercedes-Benz Service Support Stations worldwide. 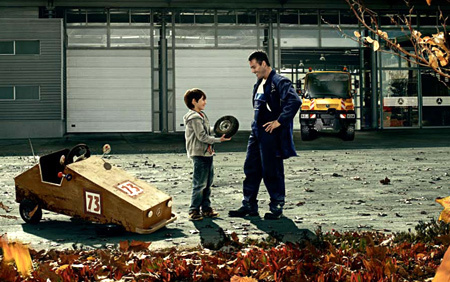 And we do it with the same care, the same experience and the same technical equipment we used to built it. And of course, only spare parts are used which come up to our own strict standards regarding quality and availability. 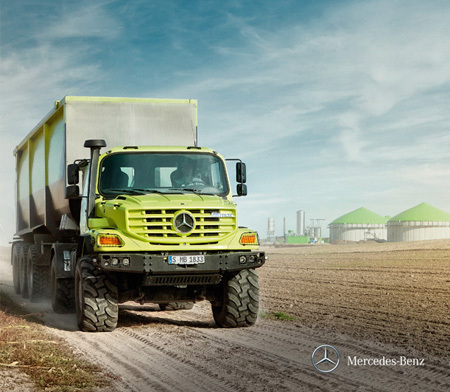 The Zetros is a highly capable off-road truck designed for extreme all-terrain operation. 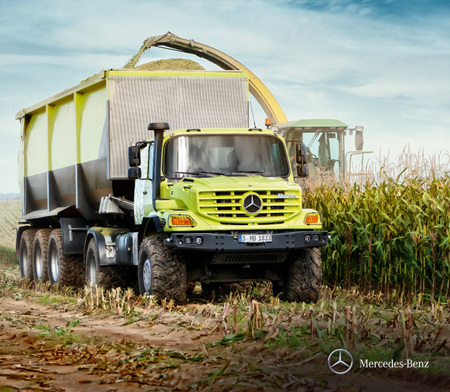 This all-wheel-drive cab-behind-engine vehicle draws on the trusted chassis and drive technology of the standard Mercedes-Benz truck model series – combined with an innovative cab concept. It was developed bearing in mind the specific technical requirements of fire-fighting operations and assignments for relief organisations as well as those of the energy industry and the particularly demanding tasks in the construction business. The core of the new Zetros’ drive system is a 6-cylinder in-line engine with charge-air cooling (OM 926 LA). Euro 5 compliant, it is particularly environmentally compatible. This compact, light turbo-diesel with a displacement of 7.2 litres delivers 240 kW and achieves a maximum torque of 1300 Nm at engine speeds from 1200 to 1600 rpm. 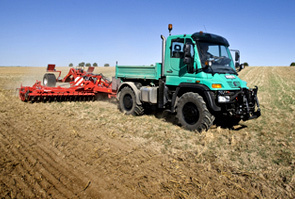 The new Zetros is available in a two-axle version, the Zetros 1833 A 4x4, with a 4800 mm wheelbase, and a three-axle version, the Zetros 2733 A 6x6, with a wheelbase of 4750 mm + 1450 mm. Chassis weights are 8.1 t and 10.5 t, respectively, with permissible gross vehicle weights of 16/18 t and 25/27 t, respectively. The standard platform reaches a length of 5.1 m (2-axle version), or 6.2 m (3-axle); other vehicle dimensions can be provided on request. This way, the Zetros offers a great variety of superstructure and special body variants, and thus consistently complements the Mercedes-Benz truck program, which has proven itself all over the world.